The new 5 series, pictured, shares as much as 70 percent of its technology with the top-of-the-line 7 series. BILBAO, Spain (Bloomberg) -- BMW AG has sold out of the revamped 5-series sedan in all markets, forcing customers to wait three to four months for deliveries. Second-quarter sales of the manufacturers' BMW, Mini, and Rolls-Royce vehicles are in line with the 14 percent gain in the first quarter, Ian Robertson, BMW's sales chief, said Wednesday at the Automotive News Europe Congress here. BMW is focusing on raising profitability as Daimler AG's Mercedes-Benz brand and Volkswagen AG's Audi luxury division step up efforts to take market share. 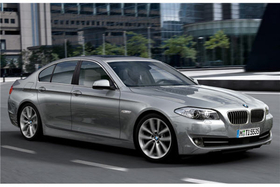 The new 5-series shares as much as 70 percent of its technology with the top-of-the-line 7 series. The 5 series starts at $44,550 in the U.S., while the bigger 7 series starts at $70,150. Robertson said BMW is sticking to its target of increasing vehicle sales by a high single-digit percentage. The company said in May it intends to deliver at least 1.3 million cars and sport-utility vehicles this year after selling 1.29 million in 2009, its lowest full-year deliveries since 2004. BMW's sales through May gained 13 percent to 552,864 vehicles.